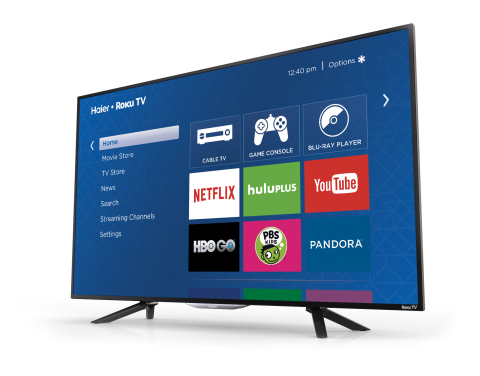 "Roku TV has set a new standard for smart TVs and has been highly praised by consumers and industry experts for its simplicity, personalization and huge selection of streaming content"
LAS VEGAS--(BUSINESS WIRE)--(CES Booth #9405) – Haier America and Roku Inc., today announced that new Haier Roku TV™ models will be available for consumers to purchase in Q3 2015. The Haier Roku TV models combine Haier’s excellent picture quality and slim bezel designs with the simple and easy-to-use Roku® streaming experience that gives consumers access to more than 2,000 streaming channels, the largest lineup of streaming channels available on a smart TV in the U.S. The Haier Roku TV 4 Series Smart LED TVs will be available in sizes ranging from 32-inches to 65-inches. The 40-inch to 65-inch models will come with Full HD resolution and a Sound Chamber that produces enhanced sound quality, with superior dampening, improved mid-range response, cleaner and deeper bass, as well as overall richer sound texture. Roku TV features a personalized home screen that brings all of a consumer’s television entertainment choices, including devices such as gaming consoles, cable boxes and Blu-ray players, together with their favorite streaming channels. Consumers can now easily watch a live television show, stream a movie or listen to their favorite song all from their Roku TV home screen. Roku TV eliminates the need for consumers to cycle through multiple device inputs or navigate complicated menus to find the entertainment they want. Roku TV provides access to the Roku Channel Store, which includes more than 2,000 streaming channels that feature 200,000+ movies and TV episodes, plus live sports, music, news, fitness and much more. Roku TV also features the unrivaled Roku Search capability that makes it easy for consumers to find exactly what they’re looking for by searching across a range of top streaming channels. Whether searching by movie or TV show title, actor or director, search results from top streaming channels are listed in order of most affordable option so customers can choose the option that’s best for them. Consumers control Roku TV with a simple and intuitive remote control, which has half the buttons of a traditional TV remote and includes a directional pad for additional convenience. Roku TV can also be controlled with a mobile device using the free Roku mobile app for iOS, Android and Windows Phone. Consumers can cast Netflix and YouTube as well as personal video, photos and music directly from their mobile device to Roku TV. In addition to launching Haier Roku TV models in Q3, Haier is releasing the 3.5 series of Roku Ready TVs in Q1 2015. Roku Ready TVs are non-connected TVs that are bundled with the Roku Streaming Stick. 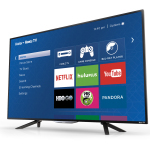 55-inch, 48-inch, and 40-inch Full HD resolution with piano black cabinet, Direct LED HDTV, Sound Chamber hidden speakers and a Roku Streaming Stick (Roku Ready version) bundled with the TV. Haier America is wholly owned subsidiary of the multinational Haier Group, a global leader in home appliances and consumer electronics. Haier employs more than 70,000 people around the world and distributes products in more than 100 countries and regions with global revenues reaching $29.5 billion in 2013. For more information, please visit www.haier.com. You can also become a Fan of Haier America on https://www.facebook.com/Haieramerica or follow Haier America via Twitter @haieramerica.